I was thinking. 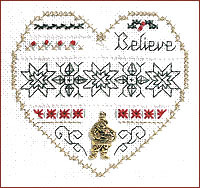 My philosophy of embroidery is: I know how to doggie paddle so why not jump in the deep end? Sink or swim, y’all! If I get stuck then I desperately hope that Needle ‘n Thread can bail me out. I’ve been throwing up some real exciting drawn thread and hardanger recently, but perhaps some of y’all prefer a more structured approach. 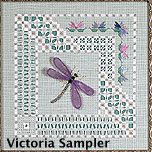 To that end, I’d like to mention a Canadian site, The Victoria Sampler. 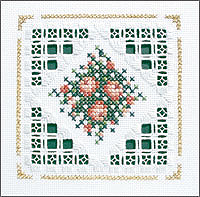 They have a wealth of resources to support folks trying to learn, including cyberclasses, stitcheramas (live webcast classes), online stitching chat groups, several learning kit series, a few nice animations demonstrating hardanger stitches, several dozen free patterns, and a number of gorgeous advanced designs. There’s a free stitch-your-own-nametag cyberclass if you want to try it out. 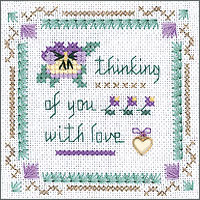 The Beyond Cross-Stitch Learning Collection has 6 levels containing 10 small kits each (costing around $10 USA including all materials). I’m including one picture from each level. 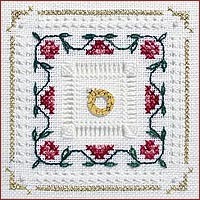 The Beautiful Finishing series covers how to finish for display your needlework in the form of bellpulls, ornaments, biscornus, boxes, and other items. 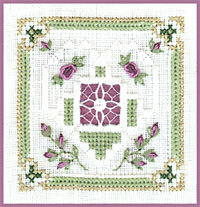 They have a variety of designs that are not in the learning series; they have many styles (samplers, ornaments, biscornus, etc), but here is my favorite trio (all of which have pattern packs, thread/accessory packs, and cyberclasses available). 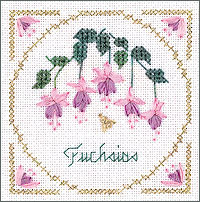 You can order online or they have a shop finder to help you locate needlework shops near you that carry these (they distribute to all over the world). 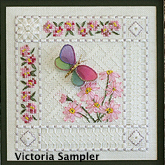 This entry was posted in Cross-stitch, Design sites, Drawn thread, Hardanger, Surface embroidery and tagged cross-stitch, drawn thread, embroidery, hardanger, hemstitching, pulled thread, silk ribbon embroidery, victoria sampler. Bookmark the permalink.